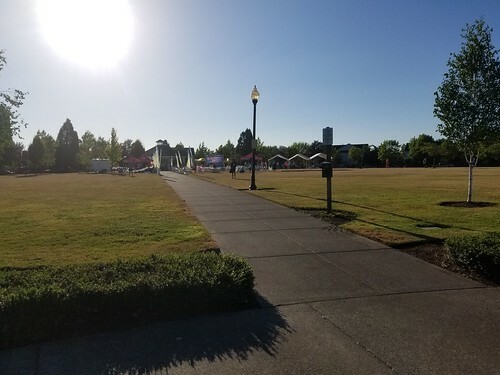 It’s been a hot summer so far, but fortunately the weather let up on the morning of the Oregon Summer Marathon/Half Marathon/Quarter Marathon. It was bright and sunny but at 8 a.m. it was only 57 degrees, about as perfect as you could ask for in mid-July. I had signed up for the quarter marathon; thanks to the 8 a.m. start time for that distance, I was able to get up just before 7 a.m. After washing up, I checked Facebook and saw that co-blogger and fellow Uberthons Ambassador Julie Mullins had posted a selfie at 6:02 a.m.(!) from the back of the shuttle bus taking runners from the finish line to the start of the half marathon. Let’s say that I might run another half marathon in the future, but that early schedule is a bit of a disincentive…. Anyway, I rolled my lazy self into the town of Banks around 7:45 a.m. (I would have gotten there five minutes earlier, except I had driven about a mile away from home when I realized that I had left my race bib behind.) Even that late, I had no problem finding parking about a third of a mile away. 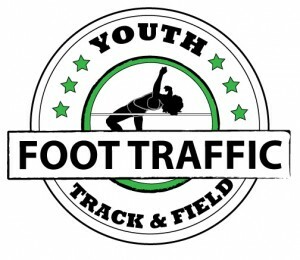 Unlike this event’s full and half marathons, which are both point-to-point races requiring the transporting of participants to the far-off start lines, the quarter marathon is an out-and-back race. Last year, there were only about three dozen quarter marathoners. This year, there were nearly 90. The lead runners took off, following Uberthons Ambassador Eileen Kuffner, who was riding the guide bicycle today. (Later on, she joked that it was course PR for her!) I closed Pokemon Go and trotted my way to the start line, waiting until I was clear of the RFID detectors before starting my GPS watch. 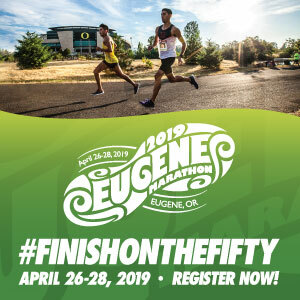 The quarter marathon started in Greenville Park and headed due west to Main Street, at which point we turned north and ran through downtown Banks to the end of the Vernonia-Banks Trail. I’ve only ever been to Banks because of this race, so I don’t have a strong impression of it, but it strikes me as having the sort of charming atmosphere that you could see in a “Northern Exposure”-like sitcom. I say this based on the cozy feeling of the buildings on Main Street – schools, fire station, small shops, and bingo parlor. A little before the one mile mark, we reached the end of Main Street and the junction with the Vernonia-Banks Trail. From there, it was about 2 1/2 miles of running on the paved trail. The sun was low enough in the sky that the trees provided ample shade, which was a definite advantage of the quarter marathon (compared to crossing this path later in the morning, I imagine). We didn’t have the course to ourselves, and there were occasional cyclists on the path, but the trail was wide enough and the cyclists were courteous enough to announce that they were passing on the left that it never felt crowded. I had, by this point, made up enough ground that I could see a trio of runners in front of me: a pair of men (one older, one younger; presumably father and son), and just in front of them, a young woman. I was thinking perhaps they were the lead runners…? I was soon disabused of that notion when I saw the true lead runners already heading back toward the finish line. The runner in first place had a considerable lead, and then was followed by a couple of others, and then after that, another small group. I wasn’t gaining ground on the trio in front of me, but wasn’t falling behind either. In fact, all in all, I was fairly happy that I was maintaining a steady pace through 3+ miles when I hit the turnaround. On the way back, I found myself thinking about the post-race burger bar, and about the upcoming Pokemon Go event* later that day. It sort of helped me stay on course by not thinking too much about the running itself. * Three hours of raiding Zapdos, with five free raid passes! Eventually, I caught up to the woman in front of me, but the two men stretched out their lead little by little, until mile 6, when I lost about 20 seconds of time due to slowing down. It’s a seemingly inevitable fact that running performance plotted against weekly mileage is an inverted curve, where too few miles and too many miles each lead to subpar results. I was definitely not on the “too many miles” part of the curve; this was going to be my longest run in three months. Somewhere during that stretch, I got passed by a very fast runner. I was a little surprised, not so much that someone passed me, but that it was so relatively late in the race. I figured that fast quarter marathoners had all started ahead of me, so I never would have been in front of them. Then I did the simple math in my head. Quarter marathon started at 8 a.m. Half marathon started at 7:30 a.m. My predicted finishing time was going to be around 50 minutes, give or take. A half marathoner with a 30 minute head start would only have to run a 1 hour, 20 minute half to finish at the same that I did (actually less, since that’s gun time). Whoever was going to win the half marathon was almost certainly going to be faster than 1:20…. Finally, it was my turn to finish. During registration, I had listed my estimated finishing time as 50 minutes. I managed to cross the line in 49:34, which was just 23 seconds slower than last year on this same course. The first thing I did after drinking water was to finish taking over the Pokemon Go gym. Then it was burger time! 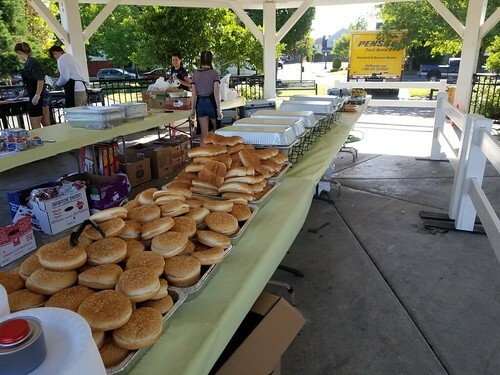 The options were burgers, hot dogs, potato salad, grapes, ice cream, and more. (For the guy in line in front of me, it was burger and hot dog time.) As I said in my preview of the race, I know it sounds weird to have a burger at 9 a.m., but in the moment, it was about as tasty as the elk burger I had the night before at Fuddruckers. * I told race director Darwin Rasmussen that I wasn’t sure which was my favorite post-race food, the burger bar at this race, or the Qdoba spread at the Spring and Fall Events. I stuck around long enough to see some of the early marathoners cross the line, including the female winner (Johanna Sylvester), who finished second overall with a sub-3 hour time! Eighteen finishers qualified for next year’s Boston Marathon with their race results. 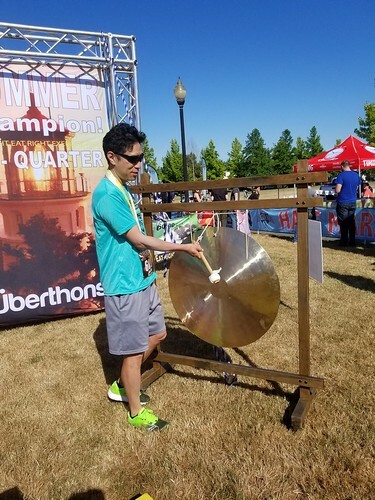 This was also the second race (after the Freedomthon) where Uberthons brought out a gong for any racer who PR’d – under a very generous definition of PR, such as a PR for the day – to take a big whack. I had not felt deserving, even under the very generous definition, at the Freedomthon, but I was happy enough with how my recovering Achilles tendons held up, and with my steady pace through 5 miles, that I went ahead and banged the gong. This is a fun race course. Like the Spring and Fall Events, it takes place far enough away from Portland that it’s a bit adventurous, but not so far that travel logistics become complicated. (Of course, that’s not true if you aren’t from Portland, and a fair number of racers weren’t.) Race support is typically strong, with plenty of aid stations offering water, electrolytes, and iced towels. And the post-race spread is hard to top! That’s really cool that you mentioned me in the article. The venue was great!